Creating a wedding celebration that's a reflection of a couple's shared values strengthens their ties and mutual understanding, and declares to all what brings—and will hold—them together. It also makes for a unique and memorable celebration. Shared values are the cornerstone of a successful marriage. Religious leaders, therapists, and common sense have been advising newlyweds of this for years. Historically, this wasn't really a question—most people found their spouse in their like-minded community and built a marriage on the common bonds of tradition and child bearing. The values expressed during a wedding celebration were dictated by a couple's shared religious tradition. Today's marriages tend more towards the romantic, but finding those common bonds and building a relationship around them is still essential. Creating a wedding celebration that's a reflection of a couple's shared values strengthens their ties and mutual understanding, and declares to all what brings—and will hold—them together. It also makes for a unique and memorable celebration. Here are some suggested ways to create a wedding celebration of value. Rather than just show up the day of to coordinate the "I dos," the right officiant can begin working with a couple at the time of their engagement. 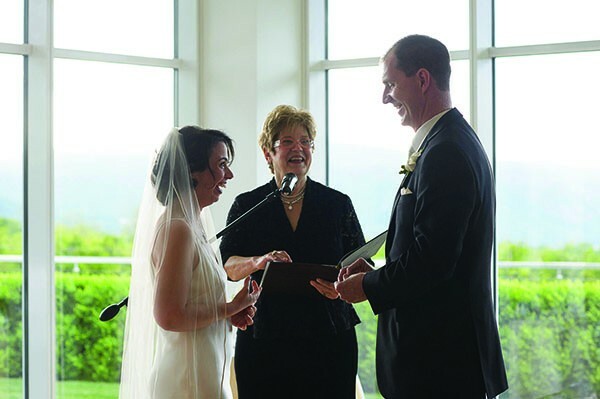 "Choose your officiant carefully," advises the Reverend Judith Johnson. "Find someone who can help you be reflective of who you are." Johnson, author of The Wedding Ceremony Planner, begins by asking each person, "What is it about you and your story and your connection that you want to celebrate? What does this marriage to this person mean to you?" After a couple is able to articulate their answers, Johnson begins helping them create their ceremony. (She also advises couples wait until after this step to approach wedding vendors.) Each writes vows, which she edits, focusing on what they are promising the other. Rituals, from the traditional to the creative, are a way to embody those vows, and she's helped couples create all sorts of symbolic rites. For example, a nature-loving couple once had their families build a rock cairn as part of their ceremony. However, she finds the traditional four-part ring exchange especially significant. "Remember," she emphasizes, "the day is going to be over in 24 hours, but you are going to impact this person's whole life. It's your job to keep the love alive." The "lighter" parts of a wedding celebration can also express a couple's deeper connection. Nichole Brodeur and Alex Payne realized this while planning their September 2015 wedding. "We understood that we couldn't have a wedding that wasn't representative of our values," says Brodeur. Passionate vegans, they began planning their festivities on a trip to the Hudson Valley when they spied a billboard for the Woodstock Farm Animal Sanctuary. 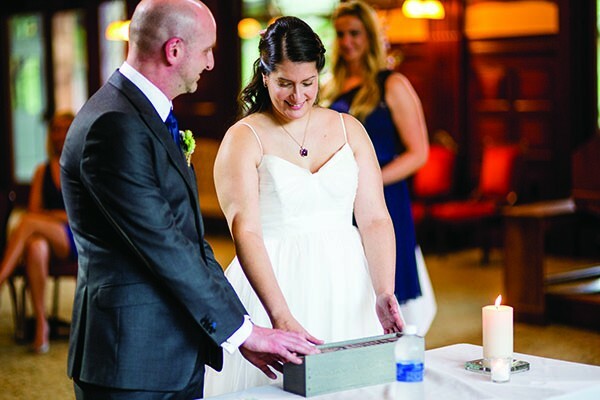 After a tour, they were inspired to book the sanctuary's small chapel for their ceremony. At that point, everything fell into place. Realizing their wedding could be a way to share their vegan lifestyle (and delicious vegan food) with the carnivores in their lives, they searched out top-notch vegan caterers, settling on chef Jay Astafa for dinner and Beyond Sushi for hors d'oeuvres. They didn't stop there. Abstaining from animal products meant they had to put some effort into finding their wedding attire (no silk or pearls for her; no leather or wool for him). Eventually, Brodeur found a vintage cotton and acrylic dress in a local shop and cruelty free, vegan bridal shoes on Etsy. ("They're beautiful and great for dancing!" she assures.) Alex had a cotton suit tailor made and ordered faux leather "Novacas" for his feet. In lieu of gifts, they are asking guests to donate to the Farm Animal Sanctuary on their behalf. "When I first meet a couple I ask: What do you want to bring into your wedding from your different cultures?" says Hudson Valley-based interfaith minister Jasmine Jordaan, who focuses on creating ceremonies that are joyful, mindful, and personal. Married for 22 years to a partner raised in a different faith, she understands the importance of respecting and combining differing traditions. "Most of the couples that ask me to marry them are interfaith. 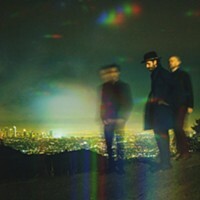 Others feel connected to something spiritual and want that to be reflected in the ceremony." After discovering a couple's unique cultural background, Jordaan helps them devise a new ritual that is meaningful to them. Often what they come up with is a combination of the traditional—such as ceremonies under a Chuppah—and the new. Candle lighting and wine box rituals are popular, and Jordaan always encourages including a couple's families in a special way. She starts each ceremony with a centering. ("I joke that, after all, I am from Woodstock!") Participants are asked to close their eyes, breath into their hearts, and connect to the reason they are there. This allows everyone to set a loving intention for the couple—love is, after all, the value all cultures and religions share. A bachelorette party hosted by Shakti Yoga. Weddings aren't just about the ceremony and reception. Often guests travel long distances to celebrate, and events can be spread out over a weekend or more. These events are a great time to accentuate shared values. 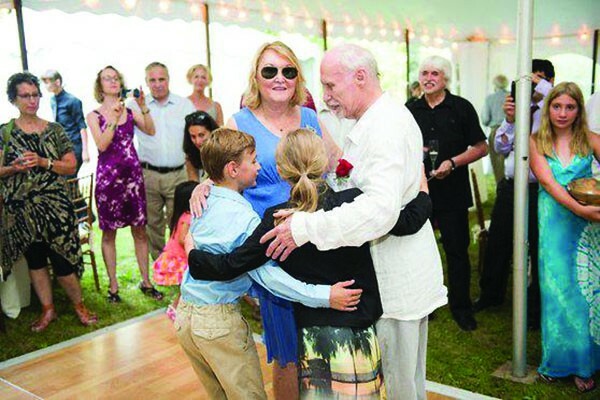 Linda Lalita Winnick, owner of the Hudson Valley's Shakti Yoga centers, helps couples incorporate yoga into their wedding celebrations by designing and leading personalized classes for wedding parties. "The couples I work with want to bring a loving, positive element into their celebration. Yoga emphasizes their complimentary attributes, giving them a way to enhance each other and look for the good in their partner." 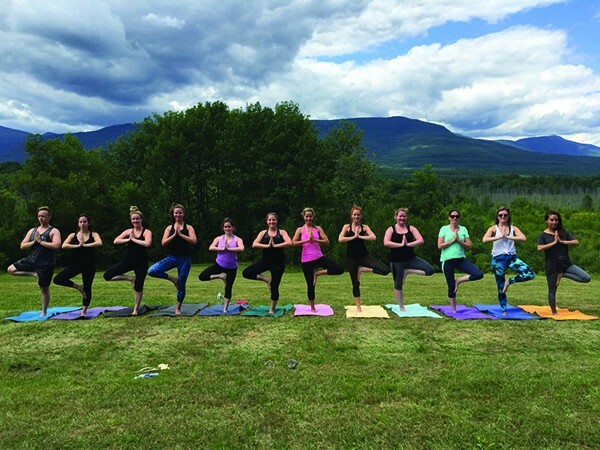 Winnick has incorporated yoga into all kinds of celebrations and adapted her classes to a variety of beliefs. But she always emphasizes stability—the foundation of both a strong yoga practice and a strong marriage. Her clients are often people who already love yoga and want to share its significance with their wedding party. "They'll invite everyone to come," Winnick says. "Guests get really into it on behalf of the wedding couple." For day-of classes, she devises a special mantra and often includes a dharma talk focused on the significance of a positive union. 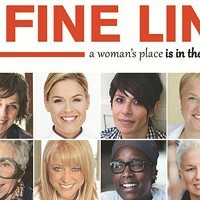 The physical practice is designed to help everyone remain centered, and she emphasizes movement and flow to help couples deal with any anxiety. "Yoga," Winnick adds, "is a great way to invest a relationship with health." Evelien and Joe perform a Love Letter & Beer Box ceremony at their wedding. Together since the day they met, Marilyn Adams and Edward Nell share many things, but one of the most significant is their love of Woodstock. "It has everything," says Adams. "It has the kind of people who care. It has music; it has art; it has beauty. You can't find a better place. We love it here." 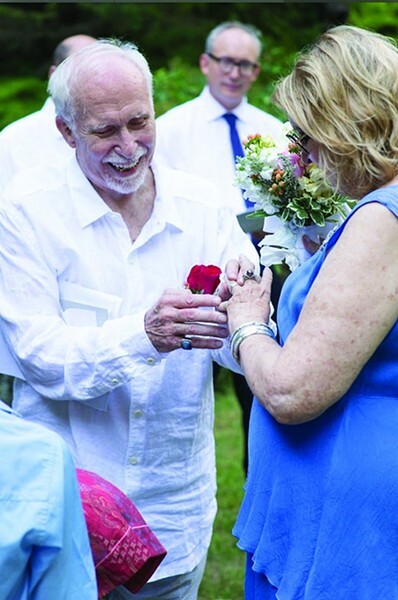 So, when they decided to finally tie the knot in August, they knew the celebration had to be at their historic Shady home, an original part of the Vosburgh Glass Mill. 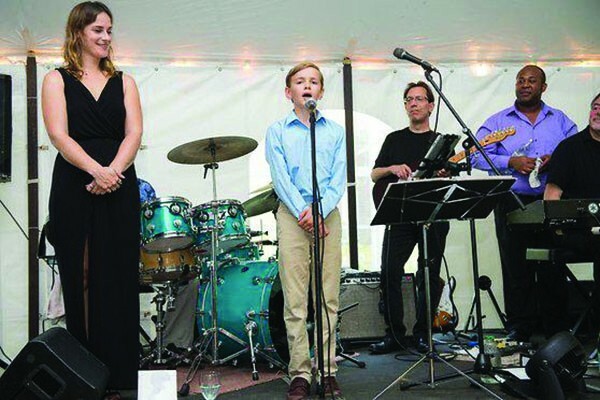 From the outfits to the rings to the music (singer Lindsey Webster), everything was sourced locally, and the couple chose vendors who were known for giving back to the community. They were even married by Town Supervisor Jeremy Wilber. Deciding to forgo gifts, they asked guests to donate to the Family of Woodstock instead. But Woodstock itself granted them one great blessing: Edward's grown children, based in London, fell in love with the place. "It's going to be a family home now, and that's very important to us," Adams says, happily. "The wedding brought everyone together. We are so lucky."